In China, Pollution Fears Are Both Literal And Metaphorical Fears of contagion shape politics in today's China. A protest by artists against smog was met with swift repression. That's because authorities fear a different kind of pollution: destabilizing ideas. 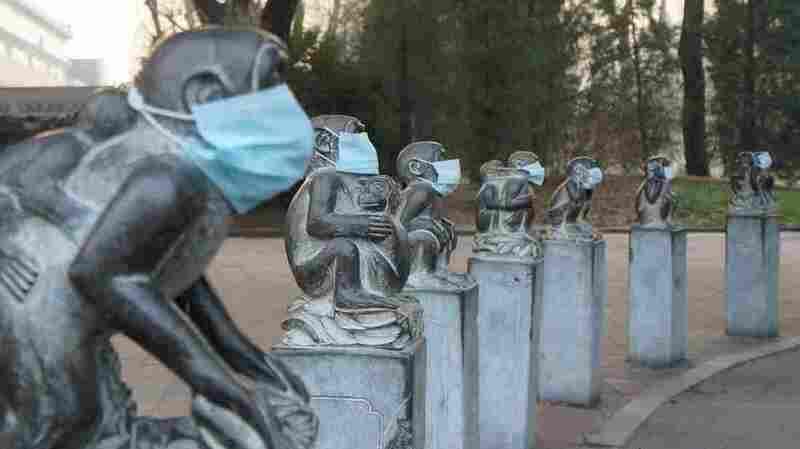 Face masks were placed on stone monkeys at the Beijing Zoo on Dec. 19 to protest heavy air pollution in northeast China. A week earlier, riot police cracked down after artists put similar masks on human figures in Chengdu. This small-scale act of protest triggered a big response. Riot police moved in to prevent anti-pollution gatherings in this inland city, and stayed in place for days. Protesters were arrested. A man was detained for spreading rumors. How different things were a decade ago, in the coastal city of Xiamen. Throngs of people blocked central streets in an organized protest against a proposed factory, which local residents feared would pose health risks. Back then, the government did not arrest the protesters and actually gave in to their main demand. It re-evaluated the project after a period of public consultation and open debate. The plan to build the factory in Xiamen was scrapped. The independent-minded Southern Weekly, China's prime intellectual newspaper, named Xiamen's citizens "person of the year" and praised the protests in a story headlined "With Courage and Ideals, They Light Up Our Future." This was no isolated event. In other cities, similar big not-in-my-backyard struggles blocked development projects. In most cases, while movement leaders were eventually punished, the protests were allowed to run their course, local governments often acceded to participants' immediate demands and there were relatively few arrests. Chinese men wearing masks walk on a bridge near a building shrouded by fog and pollution in Beijing on Jan. 5. 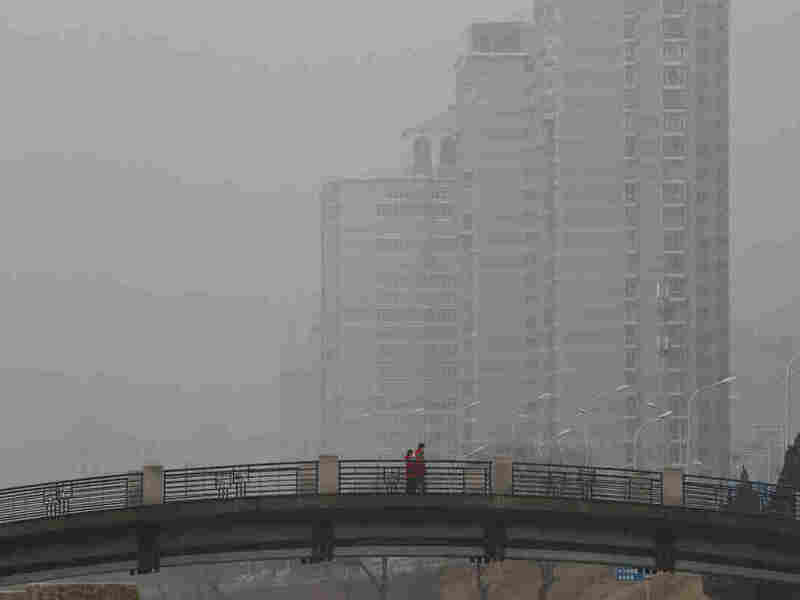 China has long faced some of the worst air pollution in the world, blamed on its reliance on coal and older, less efficient cars. Inadequate controls on industry and lax enforcement of standards have worsened the problem. What made the authorities so worried about December's small-scale Chengdu event? Why the swifter, more draconian reaction than 10 years ago? As China specialists who track environmental issues and protest, respectively, we see two things as particularly worth noting. The first is simply the passage of time. At the start of 2007, the year of the Xiamen demonstrations, China was an authoritarian country but one that was moving, albeit very gradually and sometimes glacially, toward becoming more open. As 2017 starts, by contrast, China is a country heading the other way -- especially since President Xi Jinping's rise. From year to year, rights lawyers in China have less room to maneuver, not more. The authorities have been ramping up censorship and tightening the reins on envelope-pushing publications, including Southern Weekly. Some infractions that vexed authorities in the past but were allowed to go on can no longer occur. The authorities have also been issuing more warnings lately about the need to protect the Chinese body politic from destabilizing political ideas, which a Communist Youth League website likened to a "zombie virus" of the sort portrayed in horror films, delivering "chaos" to the "infected" society. This brings to mind official drives decades ago against what was tellingly described in China as "spiritual pollution." The other thing to keep in mind when considering the protest and response in Chengdu is the way both top-down and bottom-up fears of contagion shape politics in today's China. Despite — and sometimes because of — how China has been rising, the country has stayed a jittery place due to anxieties about the potential damage that can be done by the spread of things seen as dangerous. Top-down contagion fears stem from the leadership's sense, initially triggered by events such as the 1989 collapse of communist governments in Eastern Europe and the Soviet Union's implosion, that the party-state's endurance is precarious. As striking as its longevity is, those in charge feel that constant vigilance is necessary to guard against two possibilities. One top-down contagion scenario is of a fast-spreading domestic movement, similar to those that have upended governments at various points in China's past. The other, which undergirds the effort to stem the flow of imported ideas, is of a Chinese counterpart to a "color revolution" like those seen in some post-Soviet states. Bottom-up contagion fears can drive very different sorts of protests, whose common denominator is anxiety about dangerous substances — like air pollution — moving from one place to another. When the focus is on a limited geographical area, the government often lets things run their course. When the potential reach of a struggle is broader, this bottom-up contagion fear links to the top-down worry about movements that spread widely. And the result is more likely to be swift repression. This brings us back to Chengdu. A seemingly mild expression of discontent, the artists' action nevertheless tapped into widespread anxieties. The masking of statues had a much more encompassing — and thus threatening — implication than the single location-focused NIMBY marches of the past: that no one is safe from toxic air. It had the potential to resonate with just about everyone in China. The simplicity of using smog masks to express this point was also important, especially in a country where cotton face filters are cheap and sold everywhere. It was easy for officials to imagine — especially with memories fresh of how powerful the ubiquitous umbrella became as a symbol of protest in Hong Kong in 2014 — the Chengdu act stimulating copycat actions across China. Far from Chengdu, people could soon use smog masks to signal that they've had enough of the polluted air and have lost patience with the leadership for failing over decades to tackle it. Memes and symbolically charged poems about pollution can go viral — so why not tactics? Mao Zedong famously wrote of the ease with which a "single spark" can start a wildfire. In more recent memory, the student protest wave of 1989 started on campuses in Beijing, spread throughout the city and encompassed workers and intellectuals alike. It culminated in a movement that rocked scores of urban areas. And in 1999, Chinese leaders were completely surprised when they discovered that a religious sect called Falun Gong had been able to amass supporters completely under their radar. The extent of the spread of what the authorities saw as a particularly dangerous sort of contagion — due partly to the group's admiration for a charismatic leader — surfaced when Falun Gong organized a blockade with 10,000 followers right in the center of Beijing, where all top-level leaders live. These are instances of contagious activism that China's leaders dread. The lesson is clear in the minds of those on top: Keep discontent at bay; keep it centered on local issues; keep it from spreading. And so we have a party-state that fears artists placing smog masks on statues. It is a party-state that has been trying to address pollution, knowing this a major source of public discontent. And it is a party-state that understands it needs the public to help its regulation of polluting factories, especially to help put pressure on local governments who have protected smog-producing industry. The party-state walks a tightrope, balancing the need to give sufficient space to citizens to help counter pollution with the compulsion to tightly control any sort of activism that could undermine its power. As Xi has squeezed the space for public expressions of discontent and participation, pollution continues to worsen. Rather than courageously waging a real war on smog, enlisting all citizens in the fight, Xi is betting on the risky strategy of restricting even the smallest-scale actions — even, ironically, as he takes a higher profile symbolic role in the global climate change fight. If, in the end, his administration fails to reduce pollution, Chinese citizens will rightly be angry about their situation at home, no matter what China's leaders are saying and doing in the global arena. These citizens may get bolder and bolder in pushing back against restrictions that keep them in dangerously polluted villages and cities without any effective means of resistance. Benjamin van Rooij and Jeffrey Wasserstrom are China specialists at the University of California Irvine. Van Rooij is a professor of law and director of the Long US-China Institute. Wasserstrom is a professor of history who holds a courtesy appointment in the Law School. Van Rooij has published widely on Chinese environmental issues, a subject he wrote about in a New York Times op-ed. Wasserstrom recently edited The Oxford Illustrated History of Modern China. Follow them on Twitter @jwassers and @benfuzi.